The Majority Leader of the House of Reps, Hon. Femi Gbajabiamila, has said that he was not aware that lawmakers took a bribe, as a former Minister of Finance, Dr. Ngozi Okonjo-Iweala, alleged in her book. 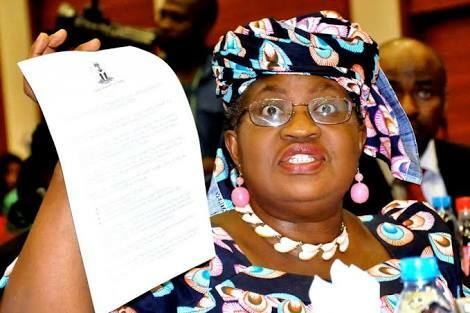 Okonjo-Iweala, in her book - Fighting Corruption is Dangerous: The Story Behind the Headlines - revealed the blackmail and arm-twisting that characterised budget passage by the National Assembly during the Goodluck Jonathan administration. She cited an instance in 2015 when the National Assembly leadership forced the executive arm to part with N17bn for the federal lawmakers before passing that year’s budget. That, she said, was at a time crude price had fallen drastically. The N17bn alleged bribe, according to Okonjo-Iweala, was besides the National Assembly’s N150bn annual “standard” budget. Gbajabiamila, who was the minority leader in the 7th Assembly admitted that lawmakers had a running battle with Okonjo-Iweala and her aides over the budget because they fused in their own projects to the detriment of some lawmakers. He explained that aside from the minister’s projects, her aides, who wanted to contest seats in the National Assembly, also loaded the budget with their own projects. The lawmaker recalled that this was a sour point in the relationship between the former minister and members. Gbajabiamila added that the “unfair” arrangement, made lawmakers to demand that many projects be sited in their constituencies as well, being the elected representatives of the people. The majority leader said it was wrong of the former minister to tag it a bribe. “However, my hunch is that being an election year, members might have wanted several projects sited in their constituencies so that they could have something to campaign on. Also, the spokesperson for the Senate in the 7th Assembly, Senator Eyinnaya Abaribe, said the alleged addition of N17bn could be an addition to the National Assembly budget, which should not be misconstrued as a bribe. He said, “I don’t think the former finance minister meant that the money was a bribe. I think it is the media that are insinuating that she bribed the lawmakers. In his reaction, another member of the House of Representatives, Abdulmumin Jibrin, said he was not aware of the alleged N17bn bribe. He said, “As the chairman of House Committee on Finance during the period in question, I was never part of a meeting where such decision was made. I am not aware of any N17bn naira introduced in the 2014 budget for election expenses for members and I did not benefit from such money if at all it ever existed. More details are expected from madam Okonjo-Iweala.